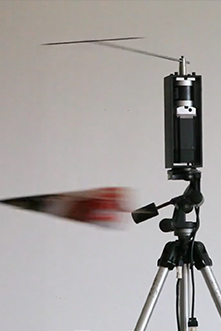 “Sopro (The Blow)” is energized by the audience through the force of their breath in a propeller. 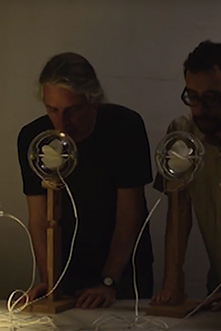 This art proposal is based on the use of a simple technological system, the poetic of breath and primary scientific principles. 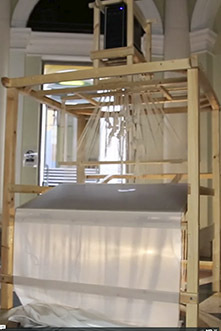 The present system in the work also reveals tune with current energy and sustainability issues, inserting them in the context of the art technology. In this installation, a paper plane was made of the magazine cover of LIFE (June 2, 1967), which ran a story of the escape of famous Chinese musician Ma Sitson from China. It flies on strings at variable speeds synced with the tempo and level of two songs: Long Life Chairman Mao (1966), and Yesterday (1965). But the playback music is barely heard by the audience. In May 1967, a year after the nationwide Cultural Revolution took place in China, large-scale anti- colonialist riots broke out in Hong Kong. Lots of Chinese propaganda slogans and music were broadcasted from the loudspeakers at the Bank of China Building in Central, Hong Kong. It was loud and heard everywhere in Central. 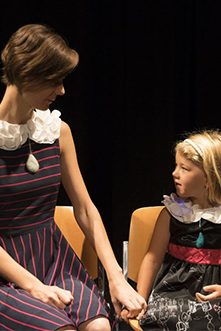 InTouch Wearables is a set of wearables that consist of dresses and shoulder pieces that allow mother and child share remote touches through garments with ambient feedback. This was developed to explore how remote touches can convey emotion and help people stay connected between remote locations. This project was created based on the lead artist’s personal experience with her child. In InTouch Wearables, a parent can increase the vividness of her conversation with a child through contextualized touch, and the loved ones may enhance the affective tone of their communication using a remote touch technology. 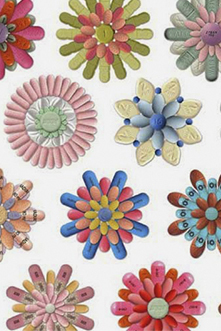 The Pillflower Project consists of scanned images of pills and tablets, digitally manipulated into flowerlike Mandelas, as well as actual medicinal pills physically assembled into miniature flower sculptures. These two and three dimensional pillflowers are then used to decorate both functional and sculptural work to create a veritable pillflower world. The Pillflower App is a gamification of the project where the user can grow, gather, play with, dream with and gift the pillflower designs. 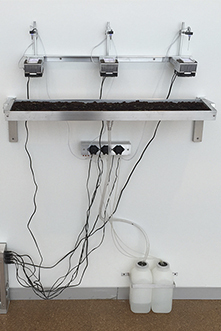 The grow function allows user to challenge themselves to recreate pillflowers. The gather function leads to collecting all 200 plus pillflowers that have been designed. 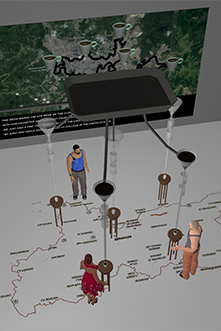 "Columbiritmos" (“Columbi”: Columbia “ritmos”: Algorithms) is an interactive, digital, kinetic, geo-location performance project that uses algorithmic functions calculated in a custom GPS tracking phone application to direct the field-user to navigate the city of Manizales, which is presently the main center for the production of Columbian coffee. White Cart Loom se desarrolla en respuesta a la investigación científica que busca interpretar y comprender los datos codificados en el proceso biológico de formación de conchas en, ahora en peligro de extinción, mejillones de agua dulce. El proyecto conecta la biodiversidad con la creatividad humana y su primera expresión a través de la programación, con los diseñadores textiles que usan la primera máquina programable, Ell telar Jacquard. En Paisley Escocia, este proceso se utilizó para explorar las posibilidades creativas del modelo Paisley de renombre mundial. In Gradual Slip, a peristaltic pump drips water onto thermal electric cooling plates (TEC) to form mini “glaciers”. After a time of buildup the system shuts down and the plates role rapidly reverses. The plates heat up and the ice slides off onto a tray of dirt and seed. From this point the seeds grow into grass flourishing in the melt water or drying out in its absence. Here the natural element is coping with artificial stresses that are introduced by anthropomorphic forces. The natural environment has evolved into a system in equilibrium. In ecosystems there is a threshold, a limit where the system can no longer function when pushed beyond this boundary. Gradual slip acts as a model of a natural system, exploring this boundary, opening itself up for a dialogue around climate change.